E Alu Pū is a network of community-based, grassroots groups and families from around Hawaiʻi who work together to improve and accelerate their efforts to care for the lands and the waters of their places. This is a kāhea (call) to our indigenous ʻohana (family) and place-based grassroots leaders from around the Pacific and the world. We invite you to break bread with us on the Windward Coast of Oʻahu before the opening of the IUCN World Conservation Congress (WCC) Forum and the Pacific Summit. 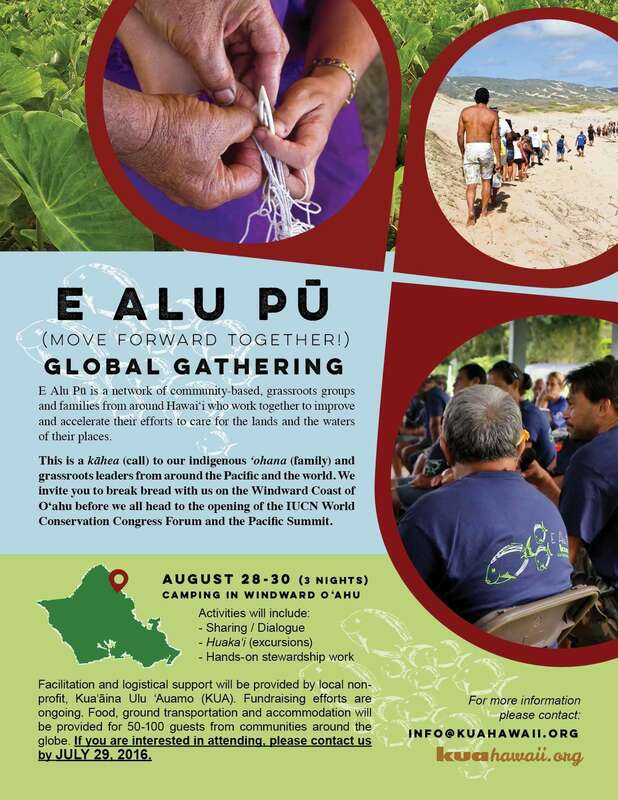 Facilitation and logistical support will be provided by local non-profit, Kuaʻāina Ulu ʻAuamo (KUA). Fundraising efforts are ongoing. Food, ground transportation and accommodation will be provided for 50-100 guests from communities around the globe. This entry was posted in E Alu Pū Global Gathering, Gatherings. Bookmark the permalink.